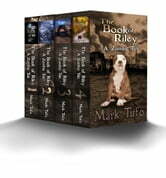 I enjoyed Books of Riley so much I hated putting it down. I have really enjoyed reading all of Mark Tofu Zombie Series including Riley, and I'm now reading Indian Hill. Now I have to admit that was one of the most unique zombie stories. Very refreshing and very different and quite enjoyable. Highly enjoyable and nice to see a certain vehicle again. Wonderful story in book One, book teo is even better, book three is great and book for amazing until the end, where the events destroy everything that cme before it. I will never buy another Tufo book.